For the good of the Holy Catholic Church, I respectfully ask once more a little of your valuable time to consider the following, and with an earnest request to present this to the Holy Father and to the President of your Bishop’s Conference. I refer to my mail of last month [http://www.ecclesiadei.nl/docs/open_letter.html] which identified for you the source of the “confusion, bitterness in human relations and fratricidal wars” that is evident in the Church since the Second Vatican Council. As befits a good engineer, after presenting you with the results of the problem analysis and its root cause, I now present to you a solution for the problem. Because the problem started due to the lack of “a gracious collaboration concerning the inspiration of the Holy Spirit” and continued with the introduction of the vague “spirit of the Council” in place of the clear hermeneutic rule set by Pope John XXIII, this problem is in essence of a supernatural origin. It therefore needs a supernatural solution, which expresses the unity between begging for mercy, a true confession of Faith and doing penance. The stakes are too high to simply ignore this fact. 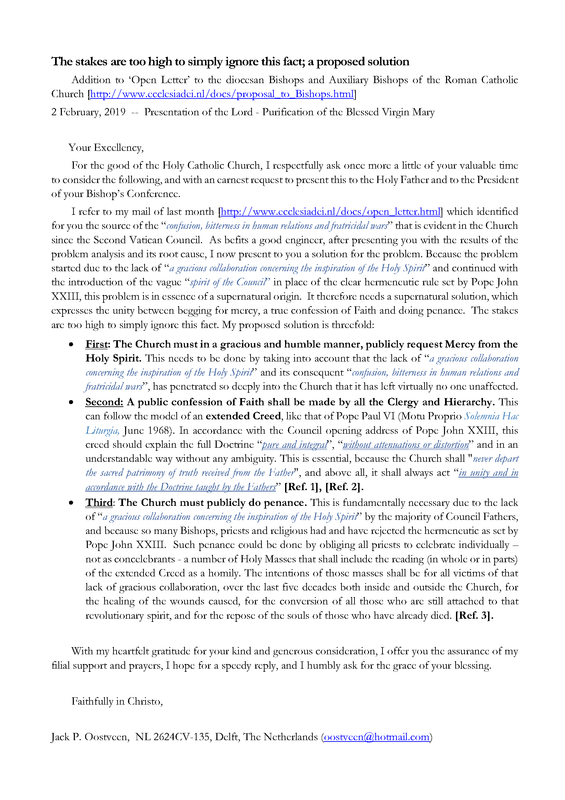 First: The Church must in a gracious and humble manner, publicly request Mercy from the Holy Spirit This needs to be done by taking into account that the lack of “a gracious collaboration concerning the inspiration of the Holy Spirit” and its consequent “confusion, bitterness in human relations and fratricidal wars”, has penetrated so deeply into the Church that it has left virtually no one unaffected. Second: A public confession of Faith shall be made by all the Clergy and Hierarchy. This can follow the model of an extended Creed, like that of Pope Paul VI (Motu Proprio Solemnia Hac Liturgia, June 1968). In accordance with the Council opening address of Pope John XXIII, this creed should explain the full Doctrine “pure and integral”, “without attenuations or distortion” and in an understandable way without any ambiguity. This is essential, because the Church should "never depart the sacred patrimony of truth received from the Father", and above all, it should always act “in unity and in accordance with the Doctrine taught by the Fathers” [Ref. 1], [Ref. 2]. Third: The Church must publicly do penance. This is fundamentally necessary due to the lack of “a gracious collaboration concerning the inspiration of the Holy Spirit” by the majority of Council Fathers, and because so many Bishops, priests and religious had and have rejected the hermeneutic as set by Pope John XXIII. Such penance could be done by obliging all priests to celebrate individually – not as concelebrants - a number of Holy Masses that shall include the reading (in whole or in parts) of the extended Creed as a homily. The intentions of those masses shall be for all victims of that lack of gracious collaboration, over the last five decades both inside and outside the Church, for the healing of the wounds caused, for the conversion of all those who are still attached to that revolutionary spirit, and for the repose of the souls of those who have already died. [Ref. 3 ]. The lack of gracious collaboration and the rejection of the hermeneutic as defined by Pope John XXIII has been initiated by those who were attached to the New Theology that in its turn was strongly influenced by modern ideologies. Here, among other points, this Creed should include a clear explanation why, in the light of the Truth, all ideologies of the modern times are principally false. This is especially so regarding the subject of unrestricted evolutionism that implicitly denies the Truth of original sin. Procreation must be stated (reiterated) as the first goal of sexuality. Homosexual activity must be acknowledged as and considered to be the main source of sexual abuse by clergy, but indeed not the only one. This can be clearly deduced from the statistics of the situation, where about 80% (USA) and 85% (the Netherlands) of the victims of sexual abuse by the clergy are male. Like all other disordered forms of sexuality, homosexuality exists due to original sin and our consequent fallen nature. Homosexual activity is therefore objectively a sin against the natural order, and as such one of the sources of sexual abuse. Though the abuse of priestly power in general is a grave sin, and creating victims of sexual abuse by that power is even a very grave sin, yet it has to be distinguished from the sexual abuse itself. The abuse of power over their victims, as well as the covering-up of sexual abuse by clergy, would not exist here without the evident lack of self-control due to a weakness of will, and the loss of discipline over their sexual feelings by the abusers. Therefore, the sexual abuse by members of the clergy must be considered as a matter of very grave sinfulness generally, precisely because it is also a violence against the vows they solemnly made to God at ordination. However, because, sexual abuse outside the Church is considerably more prevalent than that by the clergy, the very large numbers of those victims cannot count on any mea culpa’ by the worldly abusers. On the contrary, what can these victims expect from ideologist physicians, psychologists, politicians, jurists, public media and so on. They are the same people whom have strived for so many decades towards political acceptance and legalisation in favour of all kinds of disordered forms of sexuality, as if these would be normal forms of sexual behaviour. This makes the responsibility of the Church, not only towards the victims of the sexual abuse by clergy, but to all victims inside and outside the Church, all the more important and necessary. 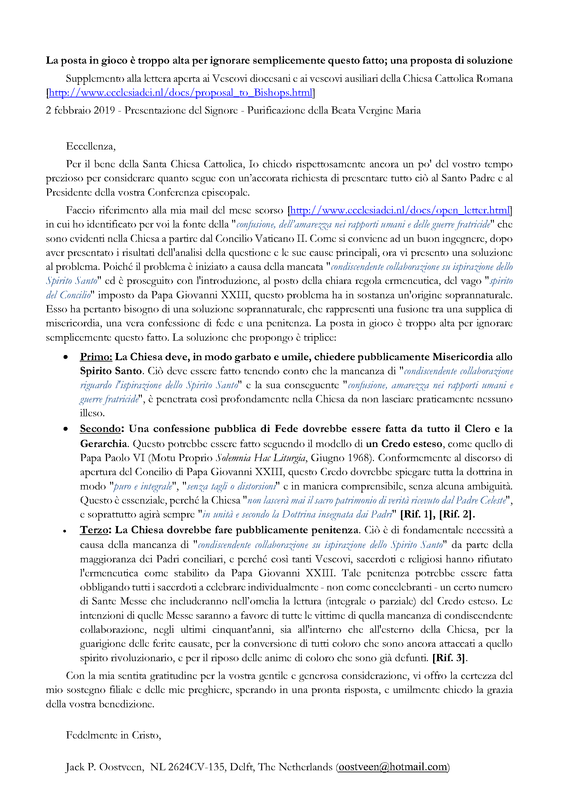 A responsibility not only for explaining the full Doctrine on sexuality “pure and integral”, “without attenuations or distortion”, in an understandable way without any ambiguity, but also for restoring and maintaining the unity between Doctrine and discipline. The rationale for proposing that “all priests shall celebrate individually – not as concelebrants - a number of Holy Masses”, is because only in this way one can be sure that all priests will be confronted individually with the text of the Creed as a penitential act. One of the Holy Masses offered should focus on the part of the Creed that explains the full Doctrine on sexuality. The intention shall be for healing the wounds of all victims of sexual abuse, both inside and outside the Church, as well as for true repentance and conversion of the abusers, and all who covered up or made the abuses possible.